Ever since the proclamation of Ukraine’s independence in 1991, Canada and Ukraine have enjoyed friendly bilateral relations. Recently, Canada, a country which has a significant number of citizens of Ukrainian origin, has been supporting Ukraine in confronting Russian aggression. Before independence, official Canadian policies were very tolerant toward the cause of attaining Ukrainian statehood. The diplomatic mission of the West Ukrainian National Republic functioned in Canada until 1923 and, also after World War I, representatives of the local Ukrainian community served as delegates to the Paris Peace Conference. Politicians of Ukrainian descent, such as Michael Luchkovich and Paul Yuzyk, actively raised the issues of human and national rights in their ancestral homeland. 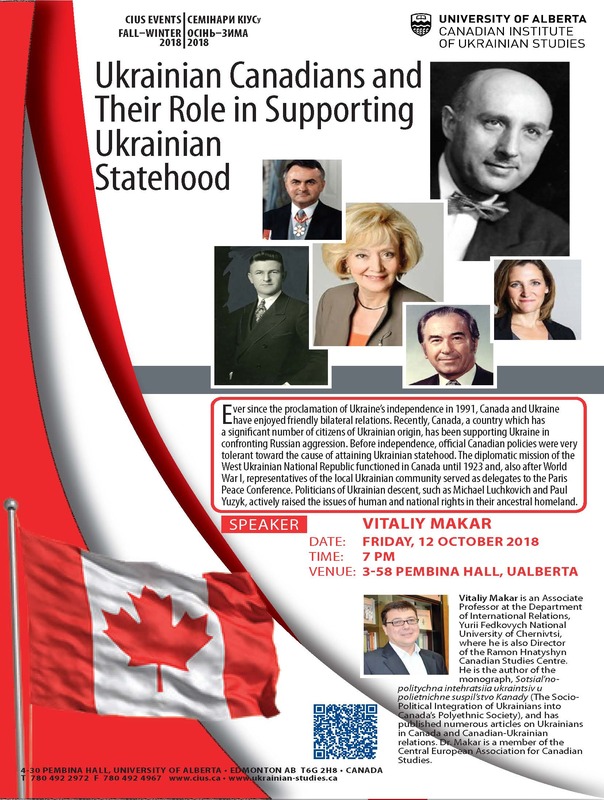 Vitaliy Makar is an Associate Professor at the Department of International Relations, Yurii Fedkovych National University of Chernivtsi, where he is also Director of the Ramon Hnatyshyn Canadian Studies Centre. He is the author of the monograph, Sotsial’no-politychna intehratsiia ukraintsiv u polietnichne suspil’stvo Kanady (The Socio-Political Integration of Ukrainians into Canada’s Polyethnic Society), and has published numerous articles on Ukrainians in Canada and Canadian-Ukrainian relations. Dr. Makar is a member of the Central European Association for Canadian Studies.